Rose Mannering is an English writer and international author. She writes both YA and children’s fiction, and her first picture book with illustrator Bethany Straker, entitled The Spotty Dotty Daffodil, was published in 2014. She lives in Kent, England, with naughty twin doggies called Boo and Delilah who don’t like having their beards brushed! Bethany Straker is an illustrator of picture books and magazines. Her work often leans toward the humorous and has been described as “somewhere between the stylings of a Steve Fiorilla and a Mike Judge series” (filmography.com). She enjoys the little visual details that others may not notice, loves drawing the grotesque, and champions the underdog. She resides in Kent, England, with her husband and son. 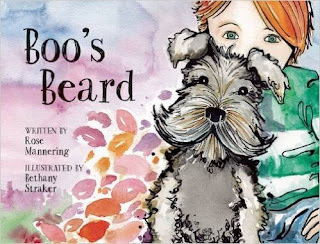 Boo's Beard is a wonderful book to familiarizes children with social disabilities, such as autism and Asperger’s syndrome. In this book children learn the meaning of facial expressions and are introduced to the possibility that some children may have difficulty interacting with them. Using Boo the dog's beard Lydia, the little girl in the book makes it into facial expressions to teach Tom about facial expressions. By the end of the book Tom understands the meaning of his own smile. My kids and I love the illustrations. They are both beautiful and fun. My kids loved this book and I highly recommend it! You can find Boo's Beard on Amazon, Barnes and Noble and other bookstores.